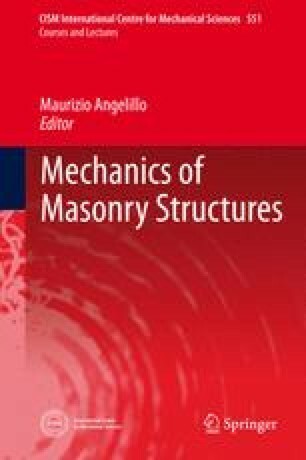 This Chapter is devoted to the application of unilateral models to the stress analysis of masonry structures. Some 2d applications of what we call the simplified models for masonry, are discussed and studied. Though the essentially unilateral behaviour of masonry is largely recognized, some prejudices still persist on the possibility of making the No-Tension (NT) assumption a practical model for designing engineers. The results here presented demonstrate that the unilateral model for masonry can be a useful tool for modeling real masonry structures. In the exposition the critical points are emphasized and strategies to handle them are suggested, both for the most primitive model (namely the Rigid NT material), and for the more accurate Normal Elastic NT and Masonry-Like (ML)materials. The first tool here introduced for applying the No-Tension model to structures is the systematic use of singular stress and strain fields. Next a number of closed form solutions for NENT and ML materials is discussed. Finally a numerical approach based on descent is proposed for handling the zero-energy modes typical of unilateral materials. Some numerical solutions and comparisons with analytical solutions and test results are also presented. This Chapter is dedicated to Giovanni Castellano who inspired most of my work on masonry since my early steps.